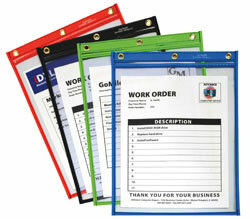 Keep you papers clean and dry with these clear super heavyweight vinyl holders featuring an eyelet for hanging! Zippered seal guards against dirt and moisture so your documents remain protected in even the roughest environments. Shop ticket holder constructed of welded vinyl. Style 82911. 15/BX. Learn about the wide variety of shop ticket holders at C-Line.. Suggested Use: Guard documents against damage from dirt and moisture in even the roughest envrionments.